This online course distills the essentials required to get started. Women from all around the world join together in this online course to awaken the core Feminine and Masculine essences. We know that as women, we thrive in community, collaboration and connection - the Essentials course offers a powerful collective field that deepens and accelerates our journey. "When I returned to the US after 4.5 straight months in India shooting our film, SOLD, and two years prior to that where I was out of the country more than I was here, I enrolled in a course with Suzanne Anderson that was life-affirming and gave me some new tools to help me deal with both my work in the world and relationships. Suzanne is offering the Mysterial Essentials course and, if you feel like you need to hit the re-set button, no matter where you are in the world, this is a great place to start." And that is what is most needed in this time on our planet — the courage and commitment, resilience and grace to lead in an entirely new, embodied, integral... Mysterial way — a way that includes all of who you are. This path is laid out in my recent book, The Way of the Mysterial Woman: Upgrading How You Live, Love and Lead. And now I have adapted the essentials required to get started on the Mysterial method into this online course. Sense that you have a real contribution to make to this world and are ready to do the inner work required to liberate your passion and genius. Are ready to courageously show up as a leader in your own life, expressing and standing for your values, while maintaining a deeply grounded connection to your own center. Sense that being held in a supportive circle of women will give you the nourishment and encouragement you need to ignite your developmental journey. Are ready for a path that is truly integral and awakens all of your Feminine and Masculine strengths. Recognize your own life journey within the unfolding of the human story, enabling you to see that you are a part of the leading edge of this story, and there are other women on this path with you. Identify a clear intention for your own Mysterial emergence that is pulling you forward. Rest into a deeper sense of sufficiency and kindness toward yourself — that your being and body has value, and that you have a natural urge to nourish yourself from a loving place. Discover how resistance to change shows up in your life, and how you can effectively work with it rather than be stopped by it. Develop your own set of doable and viable practices that will carry your transformation forward beyond this course. Learn how to use ritual to work with the unconscious in order to lead in partnership with the Mystery. Begin to experience magnetic presence: by becoming more authentic and congruent with what is inside you, you’ll begin to attract circumstances that are a better match for you and your potential. All live sessions are on the Zoom video / phone conference system, which is easy to use. All live sessions are recorded, and both video and audio recordings are available the following day for you to download and keep forever. All course information, materials and recordings are on a private website accessible only to participants. There is a private Facebook group for students to share their experiences with each other, to give and receive the nourishing support of community. 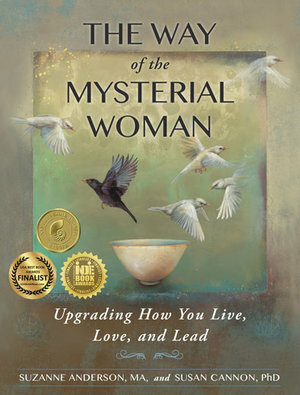 The Way of the Mysterial Woman book is required reading for the course. Participants can purchase the book here. You’ll experience the journey and tools within the Mysterial Leadership Essentials course for yourself, identifying your personal relationships with the 5 Archetypes of the groundbreaking source code for accessing your deepest potential - The Mysterial Sequence. Hundreds of women have traversed this territory, opening to the full realization of their unique brilliance. Many women desire to bring this new awakening into their work, yet don’t know how. Thus the Facilitator’s Track was born, supporting women through a deepening understanding of how an embodiment of the archetypes could substantially increase the potency of their work with others. Through the discoveries from your personal journey, you’ll start to observe how each of the 5 Archetypes show up for you in your professional life, too. When you are more resourced personally, you naturally have a stronger, more stable container for yourself as well as your work. Bringing together the two tiers will give you more capacity in your work and allow your true talents to blossom. During your journey you’ll gracefully shift into a deeper capacity for serving your clients. The Facilitator’s Track will guide you through this and more! Connect with a dynamic community of like-minded women who are interested in increasing their capacity to make a contribution to women awakening to their wholeness and innate capacity. 6 Additional Live Sessions with Suzanne - an initial overview session and then one session for each of the 5 archetypes. Audio and Video recording provided for continued learning after the sessions are complete. Live sessions are every-other week from the core course sessions: Sept. 26, Oct. 10, Oct. 24, Nov. 7, Nov. 21, Dec. 5. All sessions are Tuesdays from 12-1:15pm Pacific Time (find your time zone here). Sense that in order for your work to be more effective, you will need to make an internal shift, and are willing to go within and see what opens up.Want to make an impact in the lives of others, yet find that it is all too easy to get burnt out and lose touch with sustainable self-care and work / life balance. Note: The Facilitator’s Track is NOT a certification course - although there will be one coming in the future! Each participant will receive a printable certificate that acknowledges completion of this course. Participating in The Facilitator’s Track now means you’ll be among the first to be invited to the future Mysterial Leadership Certification program, and will already have The Mysterial Sequence embedded in your personal experience, which is an absolute requirement for supporting others through their journey.